Your ornament will be personalized by a human who is trained in calligraphy, using indelible ink and/or oil-based paints. Unless noted in the item description, any words shown above in computer-type overlay are examples of personalization placement only. Your ornament will not be personalized by a computer or screenprint machine. Arrives cradled by our exclusive, black velvet bag. This Christmas ornament is not a toy, nor is it intended for small children. Go green, go white, show your spirit, show your fight! The blond girl with green pom poms personalized Christmas ornament is a fun way to show your support and admiration for a perky gal who fires up the home team and crowd! 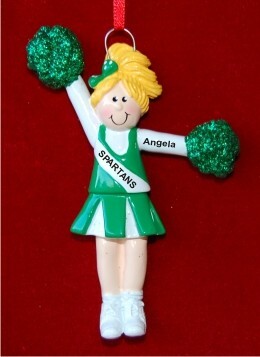 These cheerleader ornaments personalized as wonderful keepsakes of an exciting year sparkle with glitter and charm. Our lettering artists add her custom details using a very pretty font, and there's additional space on the back for a longer message, at your option. Stand behind your favorite gal or have one made up for each member of the squad with the blonde cheerleader green uniform personalized Christmas ornament in a velvet gift bag from Russell Rhodes! Enter up to 12 characters. Enter up to 4 characters. GIFT BOX: Click to see gift box for this ornament. Click again to de-select. Gift packaging service includes: removal of all stickers and glue residue; removal of tags except for Radko; interior padding/tissue as appropriate for this ornament. The packaging and service are sized and priced per ornament. 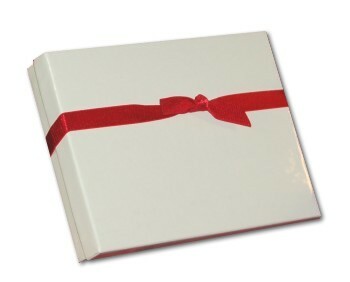 If ordering a number of gifts, we will write the recipient's name on the bottom of each box neatly so you do not have to open everything to see to whom it belongs. $6.95. MESSAGE ON BACK/BOTTOM: At your option, we can hand paint a gift message on the back or bottom (depending on ornament style). If desired, click the checkbox. $1.95. Enter up to 35 characters. REMOVE STICKERS/TAGS: This ornament arrives with retail tags/stickers. Some are easier to remove than others, and some when removed, leave glue residue that we have to use a petroleum solvent to fully remove. For a nominal fee, we would be happy to remove the tags, stickers and glue for you ($0.89). If you checked this option and are selecting our giftbox service, uncheck the box as we include tag and sticker removal within the giftbox service. No need to pay for it twice. IMPORTANT: Not all keyboards transfer what you typed. Look above to make sure what you're ordering is actually what you typed. If a letter is missing, add it. Then check the box, affirming that the information is 100% what you want. There is no way to edit, add to, delete or combine orders once placed. Norton protection and guarantees are provided free of charge to all Russell Rhodes customers.